Teach To Stamp: You're Amazing! He is so cute in his party hat! Since I was making a first birthday card, I decided to go with bright colours: Pacific Point, Real Red and Pumpkin Pie. I used four of the images from You're Amazing, and two images from That's the Ticket, and at the last minute I added the lines in the background from Gorgeous Grunge. I just felt like the background needed something. Since I didn't have a DSP to coordinate with my colour combination, I made my own using the hot air balloon image and the tiny ticket image and the three colours of ink on a 1 1/4" strip of Whisper White card stock. 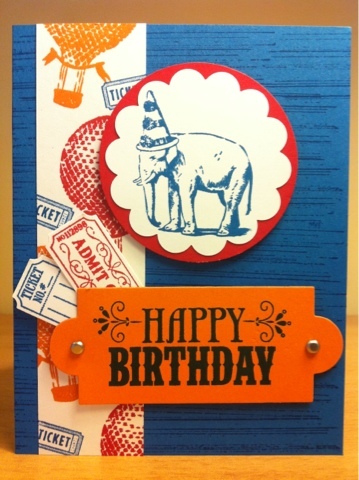 I used one of the Apothecary Accents Framelits Dies to cut out Happy Birthday and a couple of punches for the adorable party elephant. Two mini brads and a few dimensionals later, here we are, a cute birthday card!